Verticillium wilt symptoms can include wilt (top left and top right) chlorosis (top right and bottom left) and reddish to purplish discoloration of leaves or stems (bottom left) and distorted or stunted leaves (bottom left and right). Photos courtesy of Jerry E. Weiland (USDA-ARS) and Dennis A. Johnson (Washington State University). Verticillium wilt symptoms can include wilting and chlorosis as seen in this Cercis canadensis tree. 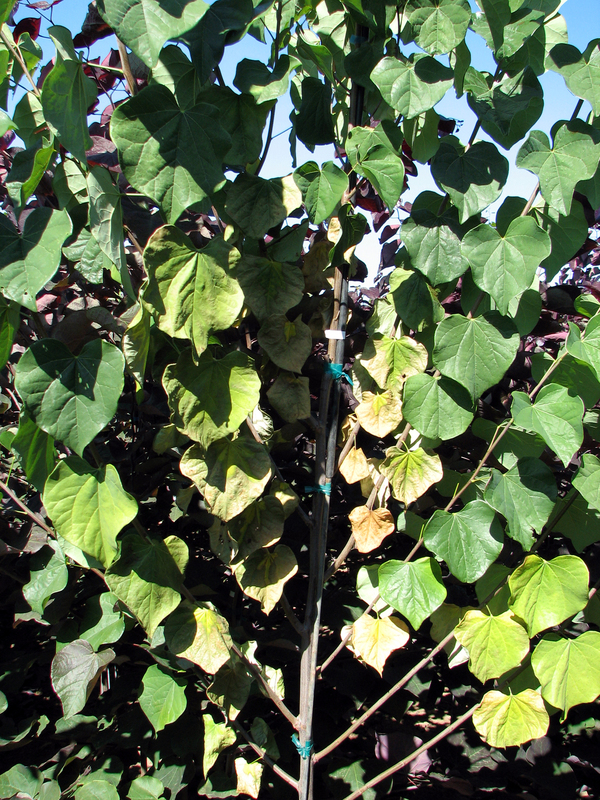 Symptoms of Verticillium wilt often occur on one side of a plant or leaf, as seen here with infected potato (left) and black raspberry (right). Photos courtesy of Jeremiah Dung (Oregon State University) and Jerry Weiland (USDA-ARS). Symptoms of Verticillium wilt often occur on one side of a plant or leaf, as seen here with infected black raspberry. Severe and extensive Verticillium wilt damage in a perennial field of peppermint. Photo courtesy of Dennis A. Johnson (Washington State University). 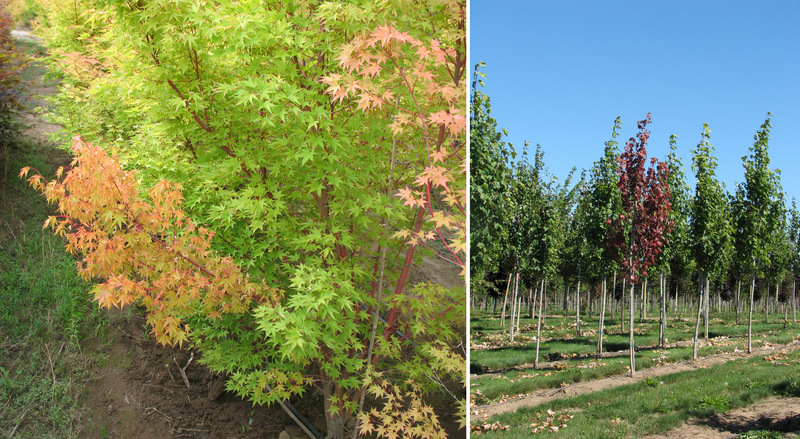 Premature fall coloration of Japanese maple (left) and red maple (right) caused by Verticillium wilt. Photos courtesy of Jerry E. Weiland (USDA-ARS). Branch dieback and death in vine maple (left), black maple (center) and Norway maple (right) caused by Verticillium wilt. Vascular discoloration of smokebush caused by Verticillium wilt. Note how the discoloration appears as a circular or semicircular pattern in cross section. Vascular discoloration of sugar maple caused by Verticillium wilt. Note how the discoloration occurs along the direction of the grain. Vascular discoloration of vine maple (bottom right) caused by Verticillium wilt. Note how the discoloration occurs along the direction of the grain and appears as a circular or semicircular pattern in cross section. 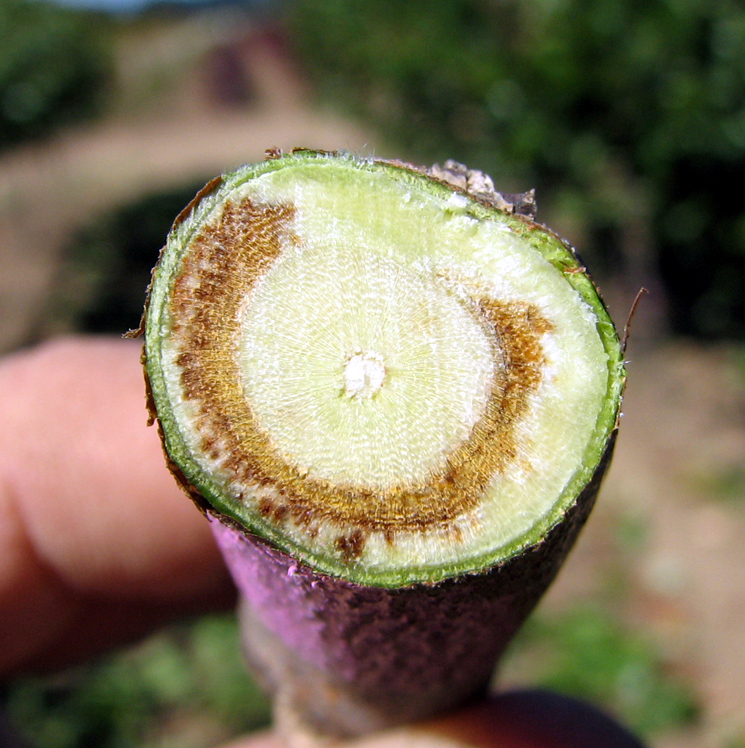 Verticillium wilt is a serious disease of many economically important agricultural and horticultural crops in the Pacific Northwest (PNW). The disease affects herbaceous annuals and perennials as well as woody trees and shrubs. 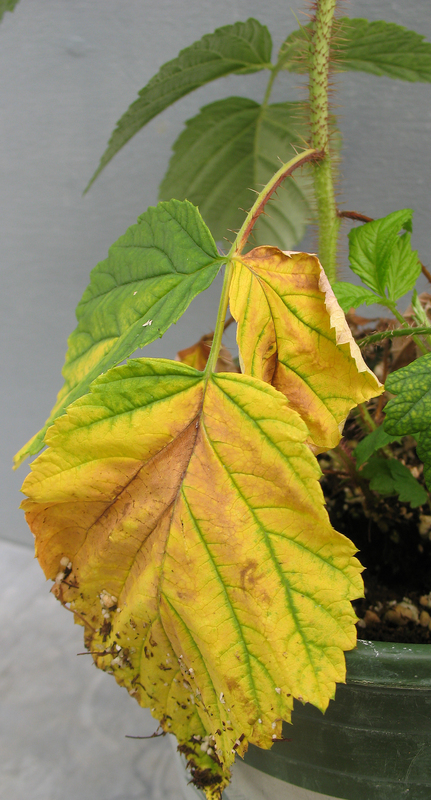 Plants affected by Verticillium wilt can exhibit chlorosis, wilting, defoliation, and premature senescence. The disease can reduce the yield of agricultural crops as well as the lifespan of plants in landscapes and perennial cropping systems, ultimately resulting in greater inputs, increased costs of production, and economic loss. Alfalfa (Medicago sativa) and hop (Humulus lupulus) also develop Verticillium wilt, though the disease in these hosts is caused by Verticillium spp. other than V. dahliae. Numerous ornamentals can be affected by Verticillium wilt including chrysanthemum (Chrysanthemum, dahlia (Dahlia spp. ), lilac (Syringa spp. ), peony (Paeonia spp. ), petunia (Petunia spp. ), rose (Rosa spp. ), snapdragon (Antirrhinum spp. ), spirea (Spiraea), sumac (Rhus spp. ), sunflower (Helianthus spp. ), and viburnum (Viburnum spp.). Certain frequently encountered weed species such as dandelion (Taraxacum officinale), groundsel (Senecio vulgaris), lamb’s quarters (Chenopodium album), nightshade (Solanum spp. ), pigweed (Amaranthus spp. ), sagebrush (Artemisia spp. ), and shepherd’s purse (Capsella bursa-pastoris) are also hosts to Verticillium species. General symptoms of Verticillium wilt can include wilt, chlorosis (yellowing of the leaves), anthocyanescence (red to purple discoloration of leaves or stems), stunted and/or distorted growth, necrosis, and premature plant senescence. Symptoms are often expressed unilaterally on one side of a plant, branch, or among leaflets and usually appear in mid- to late summer or during periods of heat, drought, or transplant stress. Reduced yield or seed production can occur. While Verticillium wilt can cause green to brown vascular discoloration, this may also be due to physiological factors, cultural conditions, or other pathogens (e.g., Fusarium) and is not necessarily diagnostic. Verticillium wilt symptoms can vary depending upon the host. In some hosts, like spinach and cauliflower, symptoms do not appear until the host initiates flowering.14 Symptoms in perennial hosts usually become more severe over the years and disease foci in perennial plantings can increase both in number and size over time.32 In woody hosts, both acute and chronic symptoms can occur over the entire plant or only a few branches.50 Acute symptoms indicate infection of the current year’s sapwood and include wilting, leaf curling, premature fall coloration, leaf loss, branch dieback, and death. Acute symptoms may appear every year or only intermittently, skipping one to several intervening years. Chronic symptoms, on the other hand, result from the death of sapwood in both the current and previous years’ annual rings, and may include slow growth, stunting, leaf scorch, and copious seed production. Acute and chronic symptoms can occur simultaneously on the same tree. Infected branches may exhibit dark, greenish-black or reddish-brown streaks in the vascular tissue along the direction of the grain, which appear as a circular or semicircular pattern in cross section. Proper diagnosis of Verticillium wilt requires laboratory testing to distinguish among V. dahlia and other Verticillium spp. as well as other vascular wilt pathogens such as Fusarium, Ceratocystis, or Ophiostoma spp., which can all cause symptoms of wilt. This is especially true in some hosts such as potato, where V. albo-atrum, V. dahliae, and Fusarium spp. cause similar symptoms. Maple, oak, and elm may also be infected by several pathogens that produce symptoms similar to Verticillium wilt—Ceratocystis virescens causing sapstreak in maple, C. fagacearum (oak wilt), and Ophiostoma ulmi or O. novo-ulmi (Dutch elm disease). The usefulness of preplant soil testing depends on the host, since not all plants are susceptible to the same species or strains of Verticillium. In crops like mint, which is only infected by certain strains of V. dahliae, assays which strictly determine the number of colony-forming units (CFUs) only provide a rough estimate of Verticillium wilt threat. Additional laboratory testing to determine the strain type would be required to understand the true risk. Similarly, assays that do not distinguish between V. dahliae and V. albo-atrum, and therefore only report a combined count of both pathogens in the soil, might potentially overestimate the risk to hosts that are susceptible only to V. dahliae. Since Verticillium wilt is a monocyclic disease, most management practices aim to reduce the amount of initial inoculum.58 Curative measures for Verticillium wilt do not exist, so control tactics should be aimed at preventing the disease. Cultural practices and soil fertility can also have an impact on current season symptoms.9 In general, maintaining adequate, but not excessive, moisture and nitrogen levels can help alleviate Verticillium wilt symptoms. However, due to the large number of hosts it is difficult to make general recommendations. Ultimately, the effectiveness of control measures depends on the host, cropping system, and environmental conditions. The following guidelines, when applied in conjunction with specific recommendations for a particular host, can be used to reduce the impact of Verticillium wilt. Recommendations for the control of Verticillium wilt in specific hosts found in the PNW are contained in this handbook. The fungus is very difficult to eradicate once it has been introduced into a field. Preventing the introduction of Verticillium into noninfested fields is important considering the ability of the pathogen to survive in soils without a host. Exclusion is particularly imperative in situations where perennial and woody (more than 1 year) crops are being grown because there are no curative treatments that can be employed once the plant becomes infected. Care should also be taken to prevent introducing the pathogen into fields that have received fumigation or other management practices aimed at reducing primary inoculum. Soil tests for V. dahliae should be conducted before planting a susceptible plant species to confirm that the pathogen is absent from the soil. This is especially true for certain woody hosts, such as maple or ash, since the presence of any amount of V. dahliae in the soil is considered a risk for production of susceptible tree and shrub species. In sites where the pathogen is present in the soil, susceptible woody plant species can be successfully grown in containers or pot-in-pot systems. However, the potting media should not contain infested field soil or hardwood mulch from infected trees. Greenhouse and nursery potting mixes should be steam-sterilized prior to use. Root barriers must also be implemented to ensure that the roots of susceptible plant species do not grow from the container and into infested field soil. In woody ornamental or shade tree nurseries where the pathogen is present in the soil, resistant or non-host species and cultivars should be used in place of susceptible hosts. Resistant cultivars of Norway maple are available52, but there has been relatively little research to explore resistance in other susceptible woody plant species. In general, all conifers are considered non-hosts of V. dahliae. Other resistant genera/species or non-hosts include birch (Betula spp. ), boxwood (Buxus spp. ), dogwood (Cornus spp. ), holly (Ilex spp. ), honeylocust (Gleditsia triacanthos), oak (Quercus spp. ), sweetgum (Liquidambar styraciflua), sycamore (Platanus spp. ), and willow (Salix spp.). Resistance may vary among species within certain genera and is also dependent on the virulence of local V. dahliae strains. Resistant plants or cultivars may still occasionally become infected by V. dahliae, but usually disease incidence is lower and the symptoms are much less severe than in the susceptible species. The pathogen may colonize the roots of some non-hosts, allowing V. dahliae populations to persist or even increase in infested soils in the absence of a susceptible host.5, 6, 55, 57 When resistant crops or cultivars are available, they should be used in conjunction with the other recommended management practices to help prevent the establishment and spread of the fungus. Crop rotation is of only limited benefit to reduce V. dahliae populations due to the pathogen’s wide host range, ability to colonize the roots of non-host crops, and long persistence in soil. Rotation to resistant or non-host plants may be necessary in cases where the pathogen is present in the soil. However, some asymptomatic hosts may serve as green bridges for Verticillium, allowing inoculum to persist or even increase between rotations of economically important crops. Rotation and incorporation of green manures, cover crops, or other organic amendments into field soils prior to planting has been shown to reduce the effect of Verticillium wilt in some crops. Several cover crops, including broccoli, sudangrass, and various mustards have been investigated for suppression of Verticillium wilt.10, 51 Crop rotation may be more effective when host-adapted pathotypes are involved, but more research in this area is needed. Verticillium dahliae, the primary causal agent of Verticillium wilt, can cause disease in hundreds of plants, including many important crops and ornamentals in the PNW. Verticillium wilt symptoms can vary depending upon the host but typically include wilt, chlorosis, stunting, unilateral dieback, and premature plant senescence. Isolates of V. dahliae can vary in aggressiveness to different hosts and different hosts can be susceptible to different strains of Verticillium. Management practices for Verticillium wilt should focus on reducing the amount of initial inoculum since curative measures do not exist. Use practices aimed at preventing the introduction (use of pathogen free-propagative materials), buildup (removing infected plants and infested debris, controlling weedy volunteers and hosts), and spread (reducing tillage and other cultural practices that move soil and infested debris, cleaning equipment between plants/fields). Fumigation with metam sodium can be effective at eliminating soilborne inoculum of V. dahliae and is often performed before growing higher value crops such as potato and strawberry. Precautions should be taken to avoid reinfesting the field after fumigation. Planting resistant or non-host crops can be effective at reducing the impact of Verticillium wilt. Crop rotation is of only limited benefit to reduce V. dahliae populations due to its wide host range and its long survival in soil. Use of resistant or non-host plants may be necessary in cases where the pathogen is present in the soil. Incorporation of green manures, cover crops, or other organic amendments into field soils prior to planting can be effective at reducing the impact of Verticillium wilt in some crops. An integrated disease management approach should be utilized for long-term management of Verticillium wilt. 1 Allen, R.M. 1953. 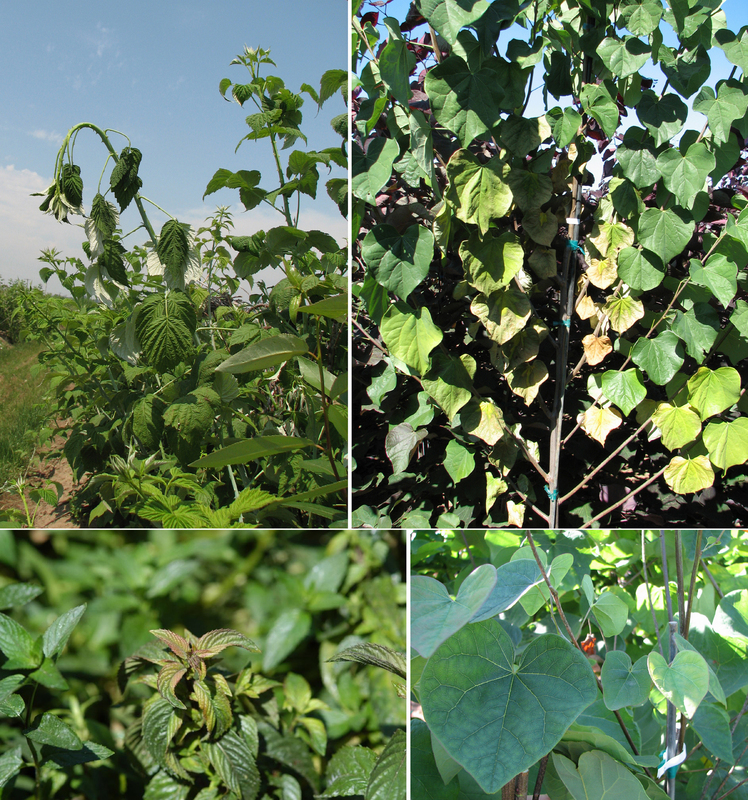 Verticillium wilt of cotton: studies of possible seed transmission. Phytopathology 43:585–590. 2 Atallah, Z.K., Maruthachalam, K., du Toit, L.J., Koike, S.T., Davis, R.M., Klosterman, S.J., Hayes, R.J., and Subbarao, K.V. 2010. Population analyses of the vascular plant pathogen Verticillium dahliae detect recombination and transcontinental gene flow. Fungal Genetics and Biology 47:416–422. 3 Barbara, D.J., and Clewes, E. 2003. Plant pathogenic Verticillium species: how many of them are there? Molecular Plant Pathology 4:297–305. 4 Bhat, R.G., and Subbarao, K.V. 1999. Host range specificity in Verticillium dahliae. Phytopathology 89:1218–1225. 5 Brown, F.H., and Wiles, A.B. 1970. Reaction of certain cultivars and weeds to a pathogenic isolate of Verticillium albo-atrum from cotton. Plant Disease Reporter 54:508–512. 6 Busch, L.V., Smith, E.A., and Njoh-Elango, F. 1978. The effect of weeds on the value of rotation as a practical control for Verticillium wilt of potato. Canadian Plant Disease Survey 58:61–64. 7 Collado-Romero, M., Mercado-Blanco, J., Olivares-Garcia, C., and Jimenez-Diaz, R.M. 2008. Phylogenetic analysis of Verticillium dahliae vegetative compatibility groups. Phytopathology 98:1019–1028. 8 Collado-Romero, M., Mercado-Blanco, J., Olivares-Garcia, C., Valverde-Corredor, A., and Jimenez-Diaz, R.M. 2006. Molecular variability within and among Verticillium dahliae vegetative compatibility groups determined by fluorescent amplified fragment length polymorphism and polymerase chain reaction markers. Phytopathology 96:485–495. 9 Davis, J.R., and Everson, D.O. 1986. Relation of Verticillium dahliae in soil and potato tissue, irrigation method, and N-fertility to Verticillium wilt of potato. Phytopathology 76:730–736. 10 Davis, J.R., Huisman, O.C., Westermann, D.T., Hafez, S.L., Everson, D.O., Sorensen, L.H., and Schneider, A.T. 1996. Effects of green manures on Verticillium wilt of potato. Phytopathology 86:444–453. 11 Davis, J.R., Pavek, J.J., Corsini, D.L., Sorensen, L.H., Schneider, A.T., Everson, D.O., Westerman, D.T., and Huisman, O.C. 1994. Influence of continuous cropping of several potato clones on the epidemiology of Verticillium wilt of potato. Phytopathology 84:207–214. 12 Dochinger, L.S. 1956. New concepts of the Verticillium wilt disease of maple. Abstract. Phytopathology 46:467. 13 Douhan, L.I., and Johnson, D.A. 2001. Vegetative compatibility and pathogenicity of Verticillium dahliae from spearmint and peppermint. Plant Disease 85:297–302. 14 du Toit, L.J., Derie, M.L., and Hernandez-Perez, P. 2005. Verticillium wilt in spinach seed production. Plant Disease 89:4–11. 15 du Toit, L.J., and Hernandez-Perez, P. 2005. Efficacy of hot water and chlorine for eradication of Cladosporium variabile, Stemphylium botryosum, and Verticillium dahliae from spinach seed. Plant Disease 89:1305–1312. 16 Dung, J.K.S., du Toit, L.J., and Johnson, D.A. 2011. Verticillium wilt of skullcap and potential for pathogen dissemination via seeds and stems. Plant Disease 95:1147–1152. 17 Dung, J.K.S., Hamm, P.B., Eggers, J.E., and Johnson, D.A. 2013. Incidence and impact of Verticillium dahliae in soil associated with certified potato seed lots. Phytopathology 103:55–63. 18 Dung, J.K.S., and Johnson, D.A. 2012. Roles of infected seed tubers and soilborne inoculum on Verticillium wilt of ‘Russet Burbank’ potato. Plant Disease 96:379–383. 19 Dung, J.K.S., Peever, T.L., and Johnson, D.A. 2013. Verticillium dahliae populations from mint and potato are genetically divergent with predominant haplotypes. Phytopathology 103:445–459. 20 Duniway, J.M. 1973. Pathogen-induced changes in host water relations. Phytopathology 63:458–466. 21 Easton, G.D., Nagle, M.E., and Bailey, D.L. 1969. A method of estimating Verticillium albo-atrum propagules in field soil and irrigation waste water. Phytopathology 59:1171–1172. 22 Easton, G.D., Nagle, M.E., and Bailey, D.L. 1972. Verticillium albo-atrum carried by certified seed potatoes into Washington and control by chemicals. American Potato Journal 49:397–402. 23 Fradin, E.F., and Thomma, B.P.H.J. 2006. Physiology and molecular aspects of Verticillium wilt diseases caused by V. dahliae and V. albo-atrum. Molecular Plant Pathology 7:71–86. 24 Gamliel, A., Grinstein, A., Peretz, Y., Klein, L., Nachmias, A., Tsror, N.L., Livescu, L., and Katan, J. 1997. Reduced dosage of methyl bromide for controlling Verticillium wilt of potato in experimental and commercial plots. Plant Disease 81:469–474. 25 Hamm, P., Ingham, R., and Eggers, J. 2011. In crop use of Telone II for the control/management of Verticillium wilt and/or nematodes impacting mint. Research Reports. Mint Industry Research Council. 26 Horner, C., and Dooley, H. 1965. Propane flaming kills Verticillium dahliae in peppermint stubble. Plant Disease Reporter 49:581–582. 27 Inderbitzin, P., Bostock, R.M., Davis, R.M., Usami, T., Platt, H.W., and Subbarao, K.V. 2011. Phylogenetics and taxonomy of the fungal vascular wilt pathogen Verticillium, with the descriptions of five new species. PLoS ONE 6:e28341. 28 Inderbitzin, P., Davis, R.M., Bostock, R.M., and Subbarao, K.V. 2011. The ascomycete Verticillium longisporum is a hybrid and a plant pathogen with an expanded host range. PLoS ONE 6:e18260. 29 Joaquim, T.R., and Rowe, R.C. 1990. Reassessment of vegetative compatibility relationships among strains of Verticillium dahliae using nitrate-nonutilizing mutants. Phytopathology 80:1160–1166. 30 Joaquim, T.R., and Rowe, R.C. 1991. Vegetative compatibility and virulence of strains of Verticillium dahliae from soil and potato plants. Phytopathology 81:552–558. 31 Johnson, D.A., and Dung, J.K.S. 2010. 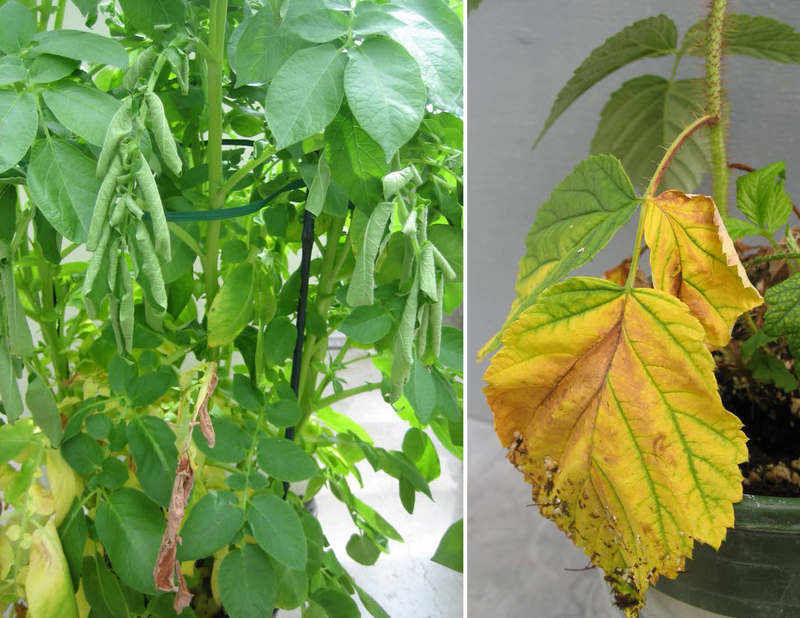 Verticillium wilt of potato – the pathogen, disease and management. Canadian Journal of Plant Pathology 32:58–67. 32 Johnson, D.A., Zhang, H., and Alldredge, J.R. 2006. 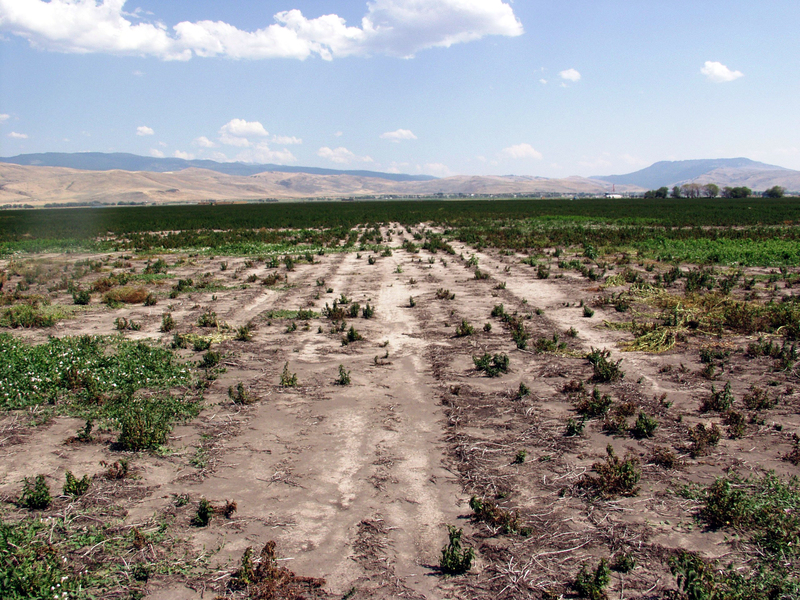 Spatial pattern of Verticillium wilt in commercial mint fields. Plant Disease 90:789–797. 33 Karajeh, M.R., and Masoud, S.A. 2006. Molecular detection of Verticillium dahliae Kleb. in asymptomatic olive trees. Journal of Phytopathology 154:496–499. 34 Katan, J., Greenberger, A., Alon, H., and Grinstein, A. 1976. Solar heating by polyethylene mulching for the control of diseases caused by soil-borne pathogens. Phytopathology 66:683–688. 35 Kawchuk, L.M., Hachey, J., and Lynch, D.R. 1998. Development of sequence characterized DNA markers linked to a dominant Verticillium wilt resistance gene in tomato. Genome 41:91–95. 36 Kawchuk, L.M., Hachey, J., Lynch, D.R., Kulcsar, F., van Rooijen, G., Waterer, D.R., Robertson, A., Kokko, E., Byers, R., Howard, R.J., Fischer, R., and Prufer, D. 2001. Tomato Ve disease resistance genes encode cell surface-like receptors. Proceedings of the National Academy of Sciences 98:6511–6515. 37 Koike, M., Fujita, M., Nagao, H., and Ohshima, S. 1996. Random amplified polymorphic DNA analysis of Japanese isolates of Verticillium dahliae and V. albo-atrum. Plant Disease 80:1224–1227. 38 Koike, S.T., Gubler, W.D., and Browne, G.T. 2005. UC IPM Pest Management Guidelines: Strawberry. Davis, CA, USA. 39 Korolev, N., Katan, J., and Katan, T. 2000. Vegetative compatibility groups of Verticillium dahliae in Israel: their distribution and association with pathogenicity. Phytopathology 90:529–536. 40 Korolev, N., Perez-Artes, E., Bejarano-Alcazar, J., Rodriguez-Jurado, D., Katan, J., Katan, T., and Jimenez-Diaz, R.M. 2001. Comparative study of genetic diversity and pathogenicity among populations of Verticillium dahliae from cotton in Spain and Israel. European Journal of Plant Pathology 107:443–456. 41 Marquez, B., Armengol, J., Vicent, A., Sales, R., and Garcia-Jimenez, J. 2005. Control of Verticillium dahliae on artichoke stumps using hot-water treatment. Acta Horticulturae 681:573–579. 42 McCain, A.H., Raabe, R.D., and Wilhelm, S. 1981. Plants resistant to or susceptible to Verticillium wilt. University of California Leaflet 2703. 43 McIntyre, J.L., and Horner, C.E. 1973. Inactivation of Verticillium dahliae in peppermint stems by propane gas flaming. Phytopathology 63:172–175. 44 Morton, A., Carder, J.H., and Barbara, D.J. 1995. Sequences of the internal transcribed spacers of the ribosomal RNA genes and relationships between isolates of Verticillium alboatrum and V. dahliae. Plant Pathology 44:183–190. 45 Okoli, C.A., Carder, J.H., and Barbara, D.J. 1994. Restriction fragment length polymorphisms (RFLPs) and the relationships of some host-adapted isolates of Verticillium dahliae. Plant Pathology 43:33–40. 46 Pegg, G.F., and Brady, B.L. 2002. Verticillium Wilts. CABI Publishers, Oxon, UK. 47 Qin, Q.M., Vallad, G.E., Wu, B.M., and Subbarao, K.V. 2006. Phylogenetic analyses of phytopathogenic isolates of Verticillium spp. Phytopathology 96:582–592. 48 Schnathorst, W.C., and Mathre, D.E. 1966. Host range and differentiation of a severe form of Verticillium albo-atrum in cotton. Phytopathology 56:1155–1161. 49 Schnathorst, W.C., and Sibbett, G.S. 1971. The relation of strains of Verticillium albo-atrum to severity of Verticillium wilt in Gossypium hirsutum and Olea europaea in California. Plant Disease Reporter 55:780–782. 50 Sinclair, W.A., and Lyon, H.H. 2005. Diseases of Trees and Shrubs. Cornell University Press, Ithaca, NY. 51 Subbarao, K.V., Hubbard, J.C., and Koike, S.T. 1999. Evaluation of broccoli residue incorporation into field soil for Verticillium wilt control in cauliflower. Plant Disease 83:124–129. 52 Townsend, A.M., Schreiber, L.R., Hall, T.J., and Bentz, S.E. 1990. Variation in response of Norway maple cultivars to Verticillium dahliae. Plant Disease 74:44–46. 53 Usami, T., Itoh, M., and Amemiya, Y. 2009. Asexual fungus Verticillium dahliae is potentially heterothallic. Journal of General Plant Pathology 75:422–427. 54 Usami, T., Itoh, M., and Amemiya, Y. 2009. Mating type gene MAT1-2-1 is common among Japanese isolates of Verticillium dahliae. Physiological and Molecular Plant Pathology 73:133–137. 55 Vallad, G.E., Bhat, R.G., Koike, S.T., Ryder, E.J., and Subbarao, K.V. 2005. Weedborne reservoirs and seed transmission of Verticillium dahliae in lettuce. Plant Disease 89:317–324. 56 Vallad, G.E., Qin, Q.M., Grube, R., Hayes, R.J., and Subbarao, K.V. 2006. Characterization of race-specific interactions among isolates of Verticillium dahliae pathogenic on lettuce. Phytopathology 96:1380–1387. 57 Vallad, G.E., and Subbarao, K.V. 2008. Colonization of resistant and susceptible lettuce cultivars by a green fluorescent protein-tagged isolate of Verticillium dahliae. Phytopathology 98:871–885. 58 Vanderplank, J.E. 1963. Plant Diseases: Epidemics and Control. Academic Press, New York.